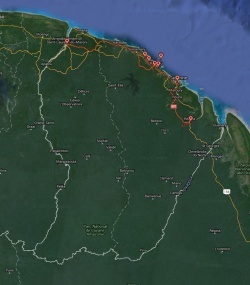 In October 2015 I visited Guyana, Suriname, and Guyane Française (French Guiana). The private tour was organized by Wilderness Explorers, a tour company in Guyana. Everything worked very well, I was very happy with the organization. I arrived in French Guiana on a small boat across the Maroni River from Albina in Suriname to Saint-Laurent-du-Maroni, the second largest city in French Guiana. I had to wait for more than half an hour for my guide to arrive, some occupation was on strike (as is usual for France) and blocked traffic. The plan was to tour the old prison, but we were too late to join the tour. We just walked around the prison complex. French Guiana was extensively used as a prison colony by France till the 50's. We had lunch in Saint-Laurent-du-Maroni. The restaurant didn't have electricity because of the strike. After a brief tour of the city we drove to Kourou, where I stayed overnight. The next morning, I was scheduled to go on a tour of the ESA Spaceport in Kourou. Because of another strike, we could not get to the spaceport in time for the tour. Fortunately, my guide was able to schedule me for the afternoon tour of the spaceport. Since I was involved with NASA for much of my professional career, I was very interested in seeing the spaceport, where the Ariane and Soyuz rockets are launched. After the space center visit we drove to Cayenne for an overnight stay. The next morning I was picked up from the hotel by a guide from the rainforest lodge that I was visiting, the Cisame Camp. We drove about 1 ½ hours to Régina, where we boarded a small speedboat for a 1 ½ hour boat ride to the camp. I stayed at the camp for one night. The camp was very well organized, very clean. The food was good, with local fish from the river. They only small drawback was the fact that they didn't have beer available. I should have brought some with me from Régina, I just didn't think about it. We made various excursions on the river to watch birds. I had the opportunity to go out on the river by myself in a kayak for an hour, which was really nice. In the later afternoon we put on swim vests and drifted down the river for about an hour, which was very pleasant. In the evening we went out in the boat to put out a dozen large fish hooks with bait, tied to trees along the bank. The next morning we went out on the boat again to retrieve the hooks. There were two large fish caught on the hooks. After another excursion through the forest we took the boat back to Régina. On the way back the clouds opened up and dumped water on us. We went through torrential rains for about ½ hour. They were prepared for rain and had wrapped all our luggage in tarps, so everything stayed dry. I, on the other hand, got wet despite the rain poncho that I had with me. Even the bucket that I put over my head was not enough to keep me dry. But it was warm enough, so this was no problem. From Régina we drove back to Cayenne for another couple of nights. The next day, my Kourou guide picked me up again. We drove to Kourou for a visit to the Îles du Salut (Salvation Islands), a group of islands that include Île Royale (Royal Island), Île Saint-Joseph (Saint Joseph Island), and Île du Diable (Devil's Island). We took a catamaran to Île Royale and walked around for a couple of hours, with lunch after that. During lunch a beautiful Scarlet Macaw visited the restaurant, walking around, looking for food. It was kind of spoiled, refused the offered bread. It only wanted the chicken. After lunch we took a boat to Île Saint-Joseph and toured the former prison facilities there. From there the catamaran took us back to Kourou, and my guide drove me back to Cayenne. The next morning I flew back from Cayenne via Paramaribo to Georgetown, where I caught my flight to Port of Spain. After an overnight there, I flew back home. Guyane Française (French Guiana) is part of France. The people there are regular French citizens, the cars have French license plates and they use the Euro as currency. It used to be used mainly as a penal colony till the mid-50's. 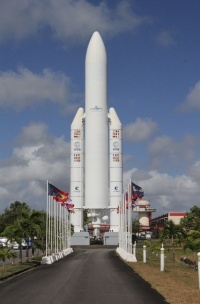 Now one of the major industries is the ESA Spaceport in Kourou. Tourism is not very developed, I believe mostly French tourists visit this country. The food and beer were quite expensive, the food not very good, unless you go to the very expensive restaurants, just like in France.